Carl Leonhardt family in 1912 courtesy of the Leonhardt family. ​This above photograph is of the family of schulmeister (schoolmaster) and church organist Carl Leonhardt. 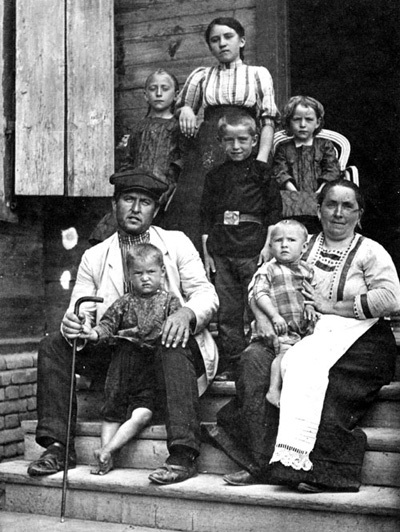 Carl came to Norka with his wife, three children and his widowed mother in 1904 or 1905. While in Norka, the widow Leonhardt married Mr. Weber, who was Katherine Rudolph's great-uncle. Two of the older Leonhardt children, Bertha and Victor, are not in this picture. The girl at the top is Eda (Edith). She is resting her arm on Amalia's shoulder. The boy in front of Eda is Carl. The names of the other three children are unknown. Carl and his mother were from the colony of Grimm. Carl's wife, Katharine Bäcker, was from Messer. Their daughter Eda (Edith) was a good friend of Mrs. Rudolph's. Carl Leonhardt was an excellent musician, "the best you can find," skilled in playing the organ and the violin. All the Leonhardt children except Eda were also musically talented. When he had to leave Norka for the army in 1916, his assistant, Julius Schott, had to do everything-but he was not a musician. Carl's other assistant, Alexander "Sasha" Leonhardt (no relation), took over the musical duties. After the war, Carl returned to Norka but left abruptly in about six months. No one knew why. He went first to Messer, then to Hussenbach, where he died. His widow was still alive when the Weber family left Norka in 1925. She had remarried after the Leonhardt children were grown and had gone with her husband über die Wolga (across the Volga River). According to Conrad Brill in his story "Memories of Norka," Carl Leonhardt allegedly was involved with a young girl who became pregnant. As a result, he left Norka.